If you’re sure that you or a member of your family has a head lice infestation, there are different ways of treating it. There is a wide range of Lyclear products available to choose from, either with or without insecticides. Lyclear have over 18 years of expertise, and have developed products to meet the needs of all families. Our treatments are easy to identify – just look for the blue Lyclear logo. Non–insecticides don’t kill head lice using chemicals, but instead by physically blocking their breathing holes (spiracles) and suffocating them. Lyclear’s double action formula suffocates and dehydrates the lice and eggs. Lyclear is available in four easy to use formats: Lyclear Treatment Shampoo, Lyclear Spray and Lyclear Sensitive. Non–insecticides are available from pharmacies and supermarkets, and don’t cause resistance because they don’t have a chemical mode of action. 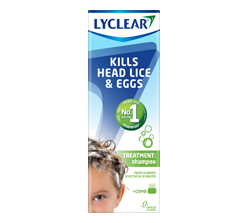 Lyclear offers superior head lice treatment solutions for every need. 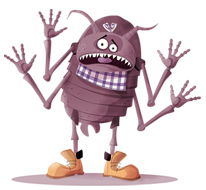 The treatment range does not use a chemical action but works by suffocating and dehydrating the lice and eggs, therefore head lice cannot become resistant to any ingredients. 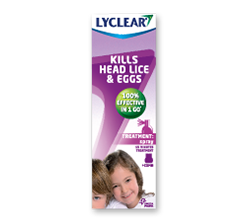 All Lyclear treatments provide a double physical action attacking both head lice and their eggs. 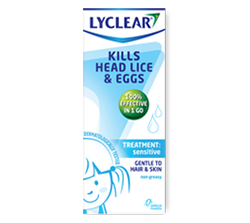 Lyclear Spray and Lyclear Shampoo suffocate and dehydrate head lice and their eggs, whereas Lyclear Sensitive attaches onto the respiratory orifices of head lice and eggs to suffocate them and penetrates into the heart of the eggs to stop their development.